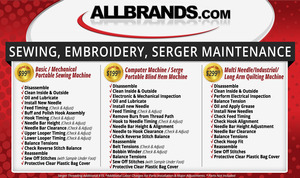 Allbrands.com has over 60 years combined factory trained mechanics experience in servicing portable sewing, serger, quilting, and embroidery machines. We now have premium professional repair services available on your sewing machine. The Sewing Machine Doctor: Fix it Right The First Time! We Service AllBrands of Portable Machines: Brother, Babylock, Bernina, Elna, Janome, Juki, Kenmore, Necchi, Riccar, Pfaff, Singer, Viking, White, Simplicity. Your sewing machine is your baby. We want to help you insure the best stitches on your sewing, quilting, embroidery or serger machine, are well adjusted and running smoothly! Ship in Service Plan for all portable home sewing and embroidery machines. Step 1. Purchase the 99.99 dollar minimum charge repair service above plus 25 dollars added for our prepaid and insured return shipping costs in USA 48 States. We will email you an Authorization Number to put on the outside of the box for easy identification. Step 2. Ship your machine insured to Allbrands.com, Attn: Service Department, 20415 Highland Road, Baton Rouge, La. 70817. Pack in original carton with all styrofoam and double boxed, or wrap in 5" of heavy bubble wrap and double boxed. Include your foot control, bobbin case, bobbin, power cord, thread, needles and fabric samples, hooped fabric with stabilizer, copies of any prior repair tickets, printouts of our email communication, order confirmation, and any written documents regarding the sewing problems you are having with your machine. Step 3. We will service and ship your repaired machine back pre-paid and insured. If mechanical adjustments or parts are needed, our mechanics will email or call you for approval of estimates above our 99 dollar minimum service charge. Our 99 dollar charge includes removing covers, cleaning, oiling, replacing covers, and balancing thread tension in sew off. Our average repair bill is 149 dollars including and average of 2 mechanical adjustments at 25 dollars each. If your machine cannot be repaired or you do not want to pay for any additional mechanical adjustments or parts required, we will send you a store credit for the 99.99 dollar to be used for any online purchase, including a replacement. The 25 dollar prepaid shipping charge will either be used to return your machine to you un-repaired, or to be credited to our mechanics for their work in dis-assembly, re-assembly, and estimating the cost of repairing your machine. Although using a Bernina 1008, most of the information applies to most sewing machines. All sewing machines do better with a little bit of ‘TLC’. Just a bit of a clean up and a drop of oil every now and then does wonders. Keeping your sewing machine clean and lubricated will reduce the wear and tear and keep everything running smoothly. Cleaning Your Machine. How to replace the needle plate and bobbin case when you clean a Brother or Baby Lock sewing machine. 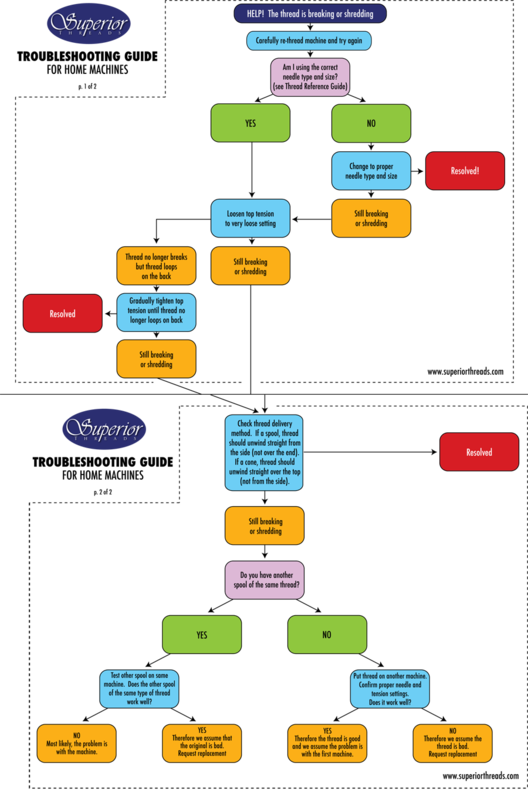 Sewing Machine Maintenance Tips | National Sewing Circle. Jessica Giardino provides extremely beneficial tips on how to perform maintenance on your own sewing machine. Learn how to make repairs to your machine at home to save money and stitch happily. Find out how often you should perform maintenance on your machine as well as what tools you may need to help clean your sewing machine. How to Clean and Oil Your Bernina Sewing Machine. Did you know you need to oil your Bernina sewing machine every 3 - 5 bobbins? You do! To many people neglect oiling their Bernina sewing machine or even worse have been told NOT to oil their sewing machine. Allbrands.com is located in Baton Rouge, Louisiana 70817, so you will need to allow for shipping time from your state to our state. Return shipping from AllBrands warehouse takes only 3 business days shipping time in the USA 48 states, due to our automatic upgrade from ground to 3rd Day FedEx or UPS shipping at no additional charge. After we receive your machine, we will diagnose the problem to see if it goes beyond a basic tune up requirement (cleaning, oiling, balancing tensions, and sew off) and advise you. We stock most repair and replacement parts. Over 90% of sewing machine repairs do not require parts, only adjustments that have probably never been made correctly, If your repair requires a part to be ordered that we do not have in stock, this will add several days or weeks to the normal 24 hour turnaround time it takes in the shop for tune ups, mechanical and electronic adjustments. We service All Brands of portable sewing and embroidery machines. You will need to determine if it is cost effective to send in your machine for repair, or purchase a new machine with up to 25 year manufacturer warranty, and up to 10 year optional extended parts and labor warranties which only applies to brand new machines. Once you purchase the service and we receive your machine, we will update you on your repair if additional adjustments and/or parts are needed. If your machine can not be repaired due to unavailability of parts, we will ship it back in 3 business days and email you an online store reimbursement credit for the minimum charge paid, which you could use to upgrade to a new machine. How will I know if my machine can be repaired? When you place your order, please add a description of your problem. We will not process and nor charge for the order if our experience suggests that it would cost more than the replacement value of the machine. service centers we have listed below, they are qualified to repair these machines. continue calling our technical support department. Just want to let everyone know how accommodating Seth the sewing machine Tech was today. I drove 2 hrs to bring my machine in for a technical problem. There were several machines ahead of me to be serviced. He went above and beyond to get to mine done so that I wouldn't have to return another day. They were so nice , I was able to shop plus hubby took me to a nice place for lunch. When we returned to check on the status of my machine Seth had it fixed and ready to go to make the 2 hour trip back home. Thank you Seth. How often should I replace my sewing needles? Machine needles should be replaced after a maximum sewing time of 8 hours. Replace needles more frequently when sewing synthetic fabric, appliqués or machine embroidery. This will avoid skipped stitches, fabric pulls and frayed threads. Machine needles are designed to break for the protection of the sewing machine hook mechanism. If a needle bends, do not sew with it. When a machine needle breaks, it is a warning to check the following: The needle type and size is correct Is the thread too thick or unsuitable for the needle size and application? Is the upper thread feeding freely? Are the thread tensions set too tight? Does the machine need cleaning? Is the correct presser foot fitted? Is the correct sewing technique being used? Is the fabric being pulled, pushed or dragged during sewing? Twin needles usually break due to excessive heat build up. Reduce speeds and avoid prolonged usage. We sell quality name brand sewing machine models from leading manufacturers: Brother, Janome, Juki Singer and Industrials We sell the best and service the rest. We also sell reconditioned machines. Accessories include presser feet, bobbins, needles, carrying cases, cabinets, tables, lamps, chairs, irons ironing boards, garment steamers. etc. We also sell patterns, fabrics, books, notions, threads, machine embroidery and quilting supplies.. all online or in our retail stores in Baton Rouge, New Orleans, Slidell, Lafayette, and Lake Charles, Louisiana... including regular classes and events. 1949 Singer Sewing Manual - THE MENTAL APPROACH TO SEWING "Prepare yourself mentally for sewing. Think about what you are going to do... never approach sewing with a sigh or lackadaisically. Good results are difficult when indifference predominates. Never try to sew with a sink full of dishes or beds unmade. When there are urgent housekeeping chores, do these first so your mind is free to enjoy your sewing." "When you sew, make yourself as attractive as possible. Put on a clean dress. Keep a little bag full of French chalk near your sewing machine to dust your fingers at intervals. Have your hair in order, powder and lipstick put on with care... if you are constantly fearful that a visitor will drop in or your husband will come home and you will not look neatly put together, you will not enjoy your sewing as you should."